Metabolism is the process by which your body converts the food you consume into energy for immediate use or to be stored for later. Your body relies on three sources of energy: carbs, fats, and proteins. Proteins aren’t a major source of energy as the body uses them primarily as building blocks. 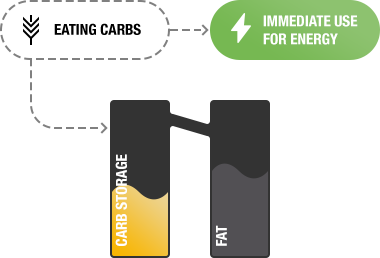 Fats and carbs, the main energy sources, are partnered up to fuel you in various situations. However, in every given situation, the ratio of fat and carb usage shifts. Your body generates more than twice the energy from a gram of fat than from a gram of carbs but requires much less energy to break down carbs. For this reason, carbs are the body’s most efficient source of fuel and their stores regulate the use of metabolic fuel. 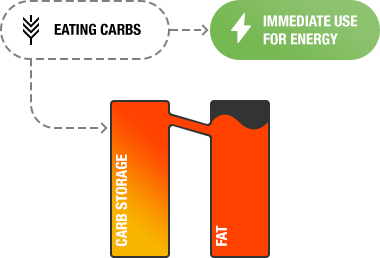 Your carbohydrate storage is the chief regulator of energy in the body. 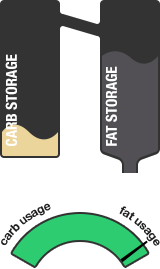 When your carb storage is empty, the body uses mainly fat. 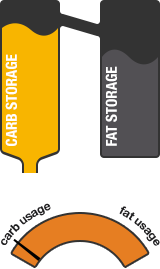 When your carb storage is not quite full, the body uses both fat and carbs. When your carb storage is full, the body uses mainly carbs. So, what happens when you eat carbs? the carbs you eat will fill it up. the carbs you eat are stored as fat. It is influenced by a wide array of factors: genetics, age, weight, gender, hormones, body composition, exercise, diet and eating habits, psychological state, environmental factors, sleep, Metabolic flexibility and more. These affect the way you utilise specific foods for energy, deplete and refill your metabolic fuel stores and achieve changes in muscle and fat mass. A central factor that defines your metabolism’s uniqueness is "metabolic flexibility", Your body’s ability to produce energy mostly from carbs or fat, and to shift between these two main fuel sources. Different type of activities call for different use of fuel stores, for example: During high-intensity activity, your body will need more carbs. During lower intensity activity your body will use mainly fat. some people are simply able to do it more efficiently. When we consume carbs, they’re broken down and stored as glycogen in the liver, muscles, and in trace amounts in the brain. 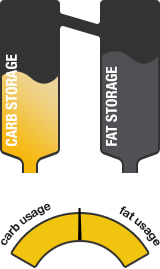 The size of your glycogen storage is dependent on many factors, including muscle mass. The greater the muscle mass, the more space your body has to store glycogen. Relative to the fat stores, these stores are small. In total, they can only hold 300-500 grams of glycogen. For this reason, we are able to deplete and refill them daily. Your body is equipped with hormones, or chemical signals, to mediate changing levels of carbs in the bloodstream. 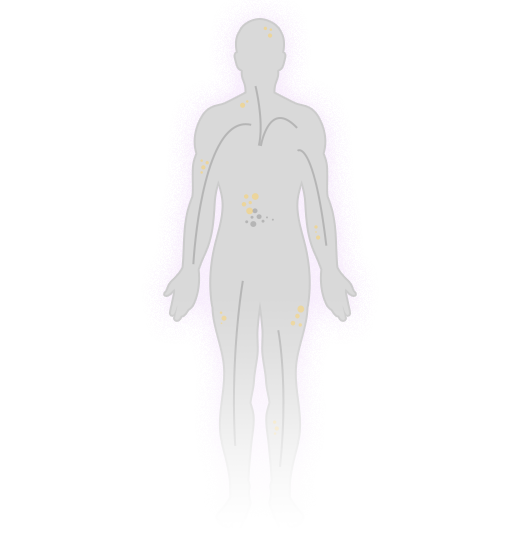 Two main hormones, both secreted from the pancreas, are responsible for this: insulin and glucagon. Insulin is released in response to elevated blood sugar levels post eating. It instructs your cells to uptake the consumed carbs for either storage or for immediate use. Glucagon is released when blood sugar levels are low. It instructs your cells to release stored carbs in order to supply the body with energy when it needs it. Your body contains different substances and mechanisms that take part in maintaining internal stability. These ensure that things such as body temperature, acidity, blood pressure, and glucose concentration remain constant. Glucose concentration is regulated by hormones in order to ensure that its levels remain close to 70-100 ml\ dl. When blood glucose levels rise, the secretion of insulin returns them to this concentration. When it falls, the secretion of glucagon does the same.